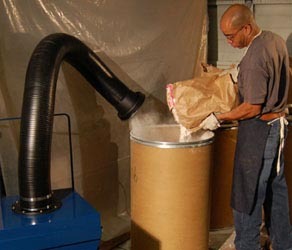 Portable Fume Extractors are respiratory engineering safety controls designed to protect the operator’s breathing zone from harmful fume and particulate generated during a variety of applications involving chemical fumes and dust. 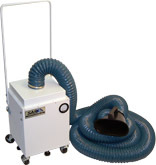 Sentry Air Systems line of portable fume extractors are available in a variety of sizes and air volume configurations and include casters, a portability handle, and a variety of source-capture flex arms [self-supportive or python style, single or multiple users]. Accompanied by multiple high-quality filtration media, these systems are designed to work with a variety of applications where fume and particulate need to be captured and purified. Typical filtration combinations include HEPA and Activated Carbon filters or specialty-blended media [Acid Gas, Mercury, Aldehyde, Ammonia]. These compact units allow significant operator control through mobility and source-capture placement. 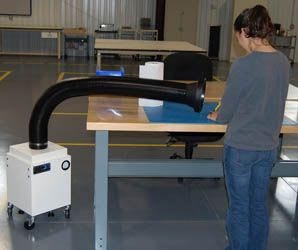 The Portable Floor Sentry fume extractor is ideal for single-operator, source-capture fume and particulate control where placement and maneuverability are critical to the operation being performed. Standard unit features include a variable speed controller, portability handle, simple and quick "no-tool" filter change, and optional accessories including a magnehelic gauge, digital hour counter, and quick change pre-filter. 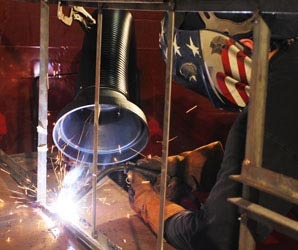 These systems are equipped with multiple filter media options and can utilize both particulate and chemical filters for applications requiring both dust and fume control. 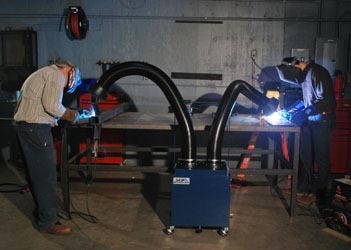 Multi-Operator fume extractors are uniquely designed to provide fume extraction for two or more operators simultaneously. These air filtration systems utilize multiple self-supportive flex arms with full range (360° rotation) capability to provide equal suction at all inlets, thereby protecting the immediate breathing zones of each operator. The Python Portable Floor Sentry is ideal for routine fume and particulate extraction performed in tight or hard-to-reach areas. The “python”-style hose gives operators extreme flexibility in positioning while the magnetic capture hood enables direct placement on metal work surfaces for hands-free operation. The Model 300 features a 4” diameter, 12’ long flame-retardant hose while the Model 400/450 features a 6” diameter, 12’ long flame-retardant flex hose. Both include a standard magnetic capture hood. Additionally, both hoses can be upgraded to 25’ lengths and the hood can upgrade to our Python HD hood with inlet grill and dual magnets.